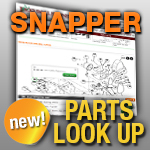 Find a replacement Snapper lawn mower muffler at Jack's. We also carry exhaust pipe for your exhaust systems. Give your equipment the smooth sound of a new muffler. Match your model or part number below!